The previous two chapters examined the two alternative approaches of retrieving cocitation counts using custom databases and cocitation frequency counts extraction systems. The cocitaion frequency counts are the inputs to the SAS or SPSS systems for multivariate statistical analysis. 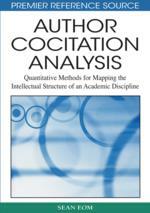 The primary purpose of this chapter is to overview several important steps in author cocitation analysis. ACA consists of the six major steps beginning with the selection of author sets for further analysis, then collection of cocitation frequency counts, statistical analysis of the cocitation frequency counts, and the validation and interpretation of statistical outputs. ACA consists of the assembling and interpretation of bibliographical statistics taken from the cited references which are taken from the selected citing articles. (See Figure 1). Compiling a predetermined list of authors inevitably involves subjective judgments. This approach can be efficient because no lengthy time is spent finalizing a list of authors for further analysis. A critical weakness of this approach is that it may often fail to identify emerging scholars in a given area of an academic discipline. The majority of previous research in this area has used the subjective approach of using a predetermined list of eminent scholars (M. J. Culnan, 1986; McCain, 1986). The reason for doing so was not because this approach is superior but because most of the previous research used commercial online bibliographic databases to retrieve the cocitation frequency matrix. It is virtually impossible to scan the entire citation databases to screen and select an author set without using the personal judgments of researchers. The objective approach does not start with a predefined list of authors at all. No subjective judgments are necessary. It will be very difficult to apply this objective approach to the commercial databases, such as social science citation index, due to the size of the databases and high costs. However, it is relatively manageable to screen the whole custom-built databases to select a list of authors for further analysis. ACA, using custom databases, allows researchers to unobtrusively select authors for the study. Emerging scholars are more likely to be included in the selection process, unlike the subjective approach discussed earlier.